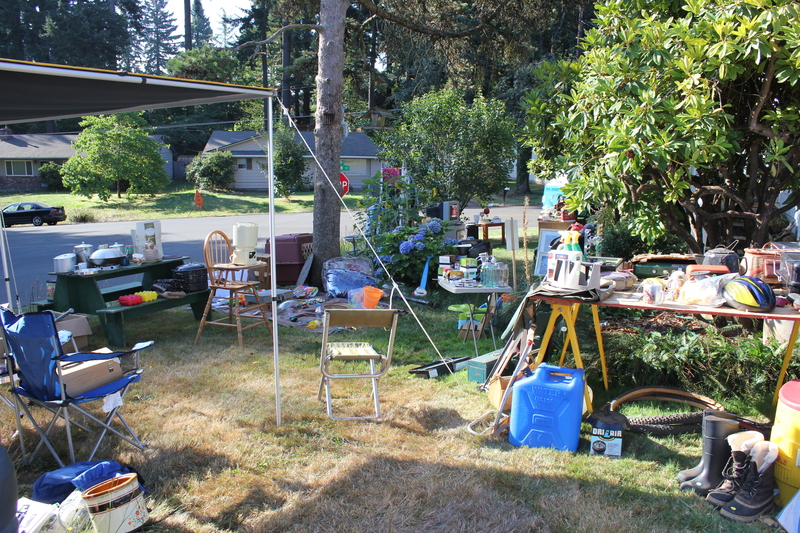 I prefer to be on the other side of a yard sale (garage sale, tag sale – whatever you call it). I buy. I discovered many years ago that most yard sales are hardly worth the time and effort when all you make is a measly $40 to $60. 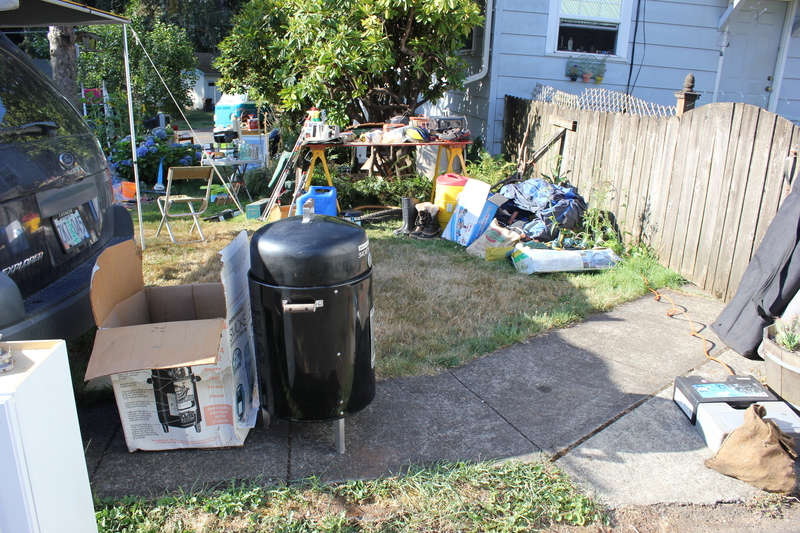 The *only* reason we decided to do a yard sale this year was the sheer amount of STUFF we had to get rid of. We decided to sell what we could and donate the rest to the Vietnam Veterans of America. Last time I held a yard sale was in 2003 and we made around $350-$400. It was not fun, but we did meet a few neighbors and we made enough money to make it worth our time and effort. This time, we made about $350. We had a lot of fun doing it. We met a lot of interesting people. We closed it down by 2:00PM on the hottest day of the weekend (today) and we were ready to be done. All that is left is to call the Veterans to come pick up what they will take and to trash the rest. We did not put sentimental prices on anything. If we put it out in the yard, we had to be willing to part with it permanently, and for cheap. We gave a lot of stuff away. The surprise of the day was on Friday when a good and dear friend wandered up to the house. He’d read the ad on Craigslist, but he had no idea who lived here. We had a wonderful mini-reunion and I sent him home with the antique autoharp that belonged to my older daughter. Sorry, Arwen, but we know you’ll never collect it and now it has a home in the hands of a very fine furniture refinisher and musician. Here is how the sale went: on Thursday evening we set up. A car pulled up to the mailbox and our neighbor leaned out of his window. “Hey… you really have a lot of junk!” He came by later when he was walking his dog and bought some items from us in the dark. $20. Sue, the Koren neighbor across the street, grabbed all my narrow-mouth canning jars (I kept the wide mouth jars). She paid me $3 plus two jars of her homemade jam. I don’t understand half of what she says, but I know one is apple and the other is blueberry, and there’s no sugar in them. Friday started slow and we despaired. Maybe it was too hot. Maybe my signs fell down. Then people started coming, just one or two at a time. Sue, the Korean neighbor, came over several times just to visit and talk. She’s lonely because her husband sleeps days. She’s hysterical. I can tell you a lot about her, and I only grasp half of what she says because her English is very lacking. My friend, Diane, came over to add to our stack of things for sale, and she ended up staying until we quit. How fun is that! Saturday started even slower. The big neighborhood sale down the hill from us had all the traffic, so all we could do was sit around and twiddle our thumbs. Chrystal and Brian came over to help and I am sure they felt pretty useless most of the day. I was selling all the little kid toys and toddler chairs, plus Tickle Me Elmo™. I figured $5 was a good asking priice for a toy that never dies, has hardly been used, and which Chrystal hated. Never have your kids come help with a yard sale! Chrystal gave Elmo™ to the cutest toddler girl from up the street from us. It was so sweet, but I didn’t get my five bucks. Seriously, this family walked over just as I was getting Harvey out to go to the dog groomer’s. The toddler wanted to pet the puppy as soon as she saw him. Then she focused on Elmo™. Her mom is the woman on the corner with a horse trailer – hmmmm. She has a QH, boards him in town, and loves all things horses. I love this woman. We met the neighbors who live on the other side of Virginia when they bought the saw blades that Don once told me he was going to make knives out of. The young man asked, when he handed us the money, “You don’t mind if I make knife blades out of them?” HA! Sue brought us a big pan of pot stickers for lunch. Oh-my-goodness-heaven-is-real! Pig Out! Two women got out, a mother-daughter pair. the daughter (20-something) wanted the top to the aquarium (I kept the aquarium because I have plants growing in it – this was the lights & slider part). We plugged it in, but the lights didn’t work. She still wanted it. I told her it was free, she gave me a dollar. The mother picked out some things and made the oddest comment when her daughter skipped back to the car: “At least she’s wearing underwear”. Um. OK. The woman from Tulsa was a favorite. She wanted the Abalone shell with all the other seashells in it. I told her it was free. I’d looked at it earlier and felt a nudge to just give it away, and there she was – desperate to have it. She had money, that wasn’t the issue. She wanted it to take home to her other daughter for their yard. She would have paid any price, I think. She dug through the box of cassette tapes that I accidentally put in the yard sale and picked out two. I would have given them to her, but I felt she’d be offended to not pay some price, so I charged her 25 cents a piece. Everyone abandoned us while they helped with some other customer, and I ended up having this wonderful conversation with her. She’s a Christian, she had four daughters and lost one twelve years ago (eyes filled up with water). I told her I understood. I don’t know how it is for other folks, but I assume it is the same in different faiths: you meet someone who shares your faith and you just know they are on the same “wave length” as you are. We were on that same “wave length” and I bless God that I got to meet her for a brief moment. Another favorite was an Hispanic woman who really wanted the shoes I had for sale, but she wears a size 8 and they are all 7-7.5 shoes. All new because I bought them, wore them once, and realized they really hurt my feet because of my bunions or the straps or… She knew the value of them & was amazed at my price ($3/pair). That’s beside the point. She bought something, but commented on the hydrangea (center of the pic above). She loved it. Where did I get it? It was her mother’s favorite flower & her mother had several in Mexico. Today was the last day. It was predicted to get into the high nineties. We planned to close shop at 2. No one came before 11AM. We were about to write today off entirely, but the family from Juneau, Alaska came. They’d just moved back here (he’s from here) with their teenagers and two adopted little ones. She’s a teacher at a Montessori school. They really looked at the Camp Chef Cookstove with the barbecue, griddle, and Wok base. $150. Don tried to sell it to a Boy Scout Troop for $100, but they claimed they didn’t have the money. We’ve used the heck out of this back when we had the F-250 and we could haul the kitchen sink with us camping. 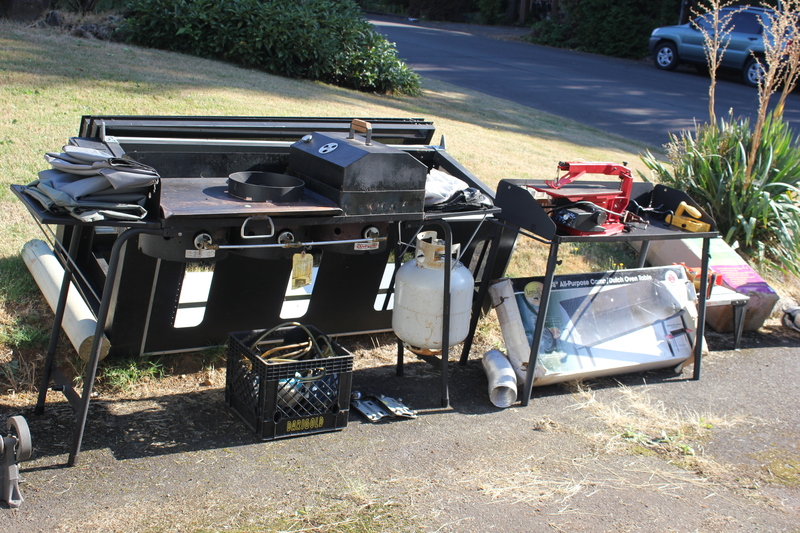 Once we had to down-size, the stove became much too big to haul with us. The Camp Chef Dutch Oven table next to it was a freebie to us and has never been used, but they weren’t interested in that. And the $150 on the stove was a bit too much for them, but they gave us their phone number just in case we did not sell it and they could convince the school that it was a good investment. Meanwhile, the kids found the free toys. The little girl took all the noise-making tools: hammer, saw, measuring tape, wrench. They say things like “You nailed it!”. Obnoxious Grandma toys that my grandsons loved when they were still little and lived nearby. The little boy found the jeep and zoo animal set (he paid me $0.50 because his mom said one free toy was enough – darn!). I tried to give a bunch of free toys away to a little boy later, but he zeroed in on the collector semi truck instead and paid me $0.50. His older sister, however, had no qualms. “Even the scooter is free?” If it’s on the canvas, it’s free. I don’t think Chrystal really used the scooter. Next thing I knew, a 13 year old girl was scooting down the street and making a U-turn. That girl knew how to ride it and was thrilled beyond words to have it. You’d think that would be the score of the day: the joy on kids’ faces – right? Yes. 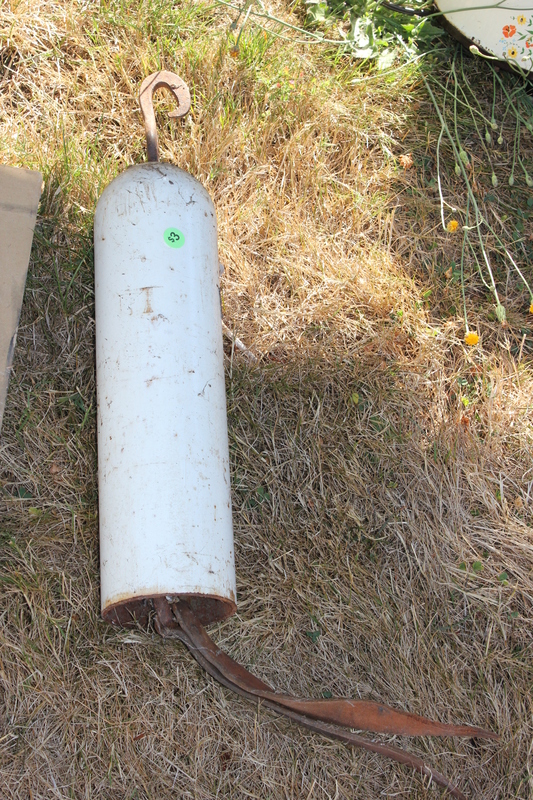 And no – Montessori school people came back with all the cash they had on hand: $59. Would we take it? The stove went to a good cause and a good family. While we only made $350 (mostly because we kept giving away stuff), I feel so blessed. We have great neighbors, we were able to make small children smile, treasured items went to good homes, and I got to meet the lady from Tulsa. I don’t plan on having another yard sale EVER. Thank you to all who helped: Sue, across the street who cannot speak English and who has an infectious giggle (and is an awesome cook); Diane, who made $10 but spent more for her husband; Chrystal and Brian; and all the neighbors who introduced themselves, even if they didn’t buy anything. P.S. Harvey looks like a Dalmatian again. Tomorrow is supposed to hit triple digits. He’s a very happy dog. Wow you got a lot of junk, I didn’t come over cause I should have been selling my pile of junk too. some day . . . . 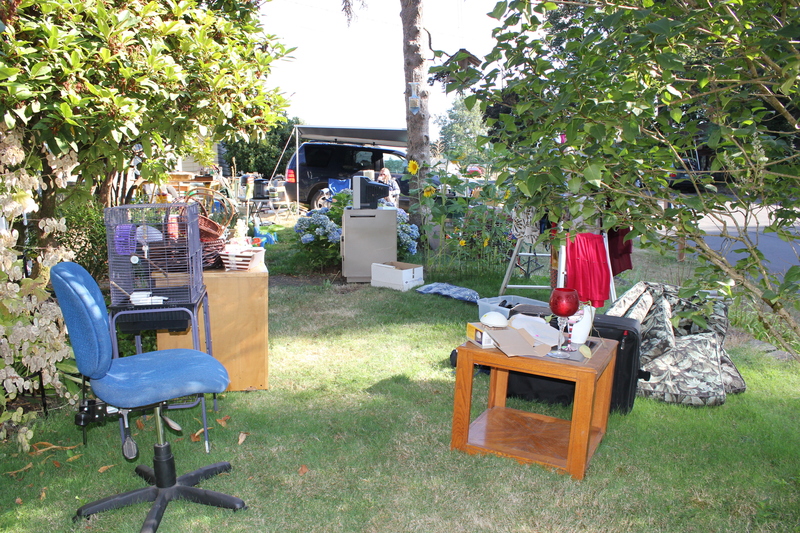 I am thinking Goodwill is a better alternative to a yard sale… Mary, it is so much work for so little money!